The story of man is the story of God as revealed in His Word. The history plays best demonstrate the Kingdom Impact Theater motto, "The best script is Scripture. " Discover how the Scriptures have shaped our daily lives even when we don't realize it. 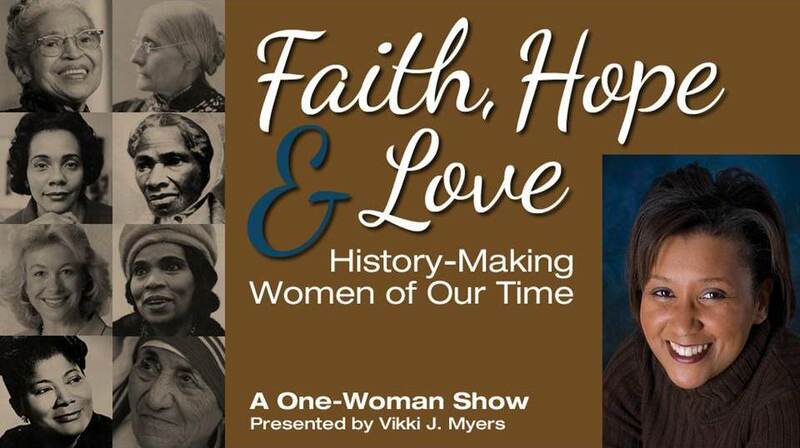 Add meaning to Women’s History Month as Vikki J. Myers presents portrays women such as Susan B. Anthony, Rosa Parks, Mother Teresa and others in a solo musical monologue of women whose faith in God upheld them in history-making situations. Music and history combine to connect African-American spirituals, Civil Rights protest songs, Christian anthems with the scriptures that inspired them, and how that foundation in Christ can inspire global liberation today. ​2 actors present the story of the 66 books of the Bible in a 90-minute reader's theater performance that brings perspective about Biblical literacy and its influence on Western culture in music, art, education, laws and everyday language.